Store, recall, and weigh with the 2200CW built-in database! This internal database will store up to 250 Checkweigh Tolerances, Tare Weights, Accumulation and Counter totals, and six-digit Product IDs. Recalling a product from the database is as simple as pressing the PROD button and entering the product ID. Adding new products or maintaining existing products is quickly accomplished through the keypad or through the optional CheckWay software. The data is password-protected to ensure that your products are checkweighed properly every time. Handwritten production records to track weighments or accumulated weight are a thing of the past with the 2200CW Digital Weight Indicator. The counter memory stores the number of weighments. Recalling the accumulated weight at the end of a pallet load of product or at the end of the shift is as simple as pushing a button. For heavy washdown environments and HACCP requirements, choose Rice Lake's CW-90X. 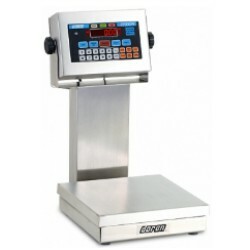 The over/under CW-90X checkweigher features hermetically sealed load cells, 304 stainless steel construction, extra-strength piezo keypad, and an IP69K rating to survive daily sanitary washdowns. The CW-90X features the toughest keypad available. This rigid piezo device is made to withstand sharp knife-point contacts, and is resistant to most contaminants and liquids. The configuration menu of the CW-90X is accessible through the front keypad, eliminating the need to open the back of the indicator and expose the unit to moisture or contaminants. Access to these keypad controls can be limited to meet the operator's needs. The CW-90X will store detailed information for up to 50 separate IDs (expandable with WeighVault Software), allowing for easy recall of previously saved information. An adjustable contrast display is visible in any environment. The CW-90X keeps things simple to meet the needs of today's lean manufacturers. Use this checkweigher by easily watching the over/under lights. Program the unit with specified weight limits and a red light will display an underweight condition, yellow for over, and green when a target weight is reached. Rice Lake's CW-90X will help error-proof your production process and achieve your productivity goals. 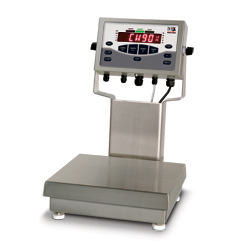 Combining a NSF / USDA certified food-safe design, durable stainless steel construction, and industry leading software, the Ohaus CKW series of bench scales are dedicated checkweighing scales built for applications requiring fast and accurate operation. 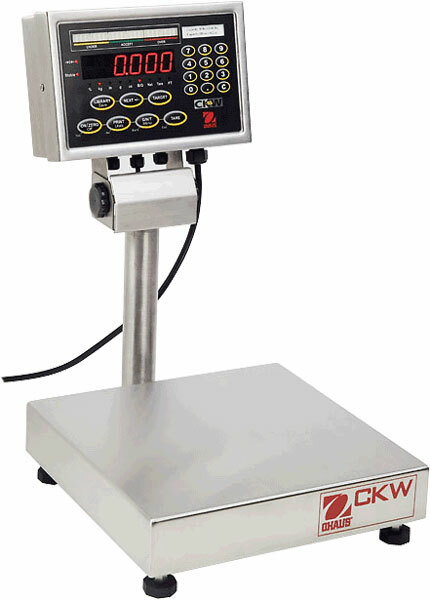 Designed with the operator in mind, the Ohaus CKW scales are easy to operate, but allow full configuration to match different checkweighing procedures.